Dr. David Molden, DG, ICIMOD, interacts with ALR participants. Dr. Molden emphasised that CARIAA is uniquely poised in contributing towards building scientific robustness in the HKH region. How can communities of researchers, thinkers, planners and experts continue to ring warning bells about the ever increasing effects of climate change? More importantly, how can the quality of research being generated from initiative similar to HI-AWARE’s be synthesized into sensible messaging for policy-and-practice community at large? A “one-size-fits-all” approach is untenable not only in terms of what we produce, but also in how we reflect at the end of this process. Fortunately, as a research initiative have some important guideposts that have helped point us in the right directions. One such type of guide is a form of a learning and review process. HI-AWARE as part of the larger Collaborative Adaptation Research in Africa and Asia (CARIAA) organized its third Annual Learning Review (ALR3) at Kathmandu during May 3-6. 2017. 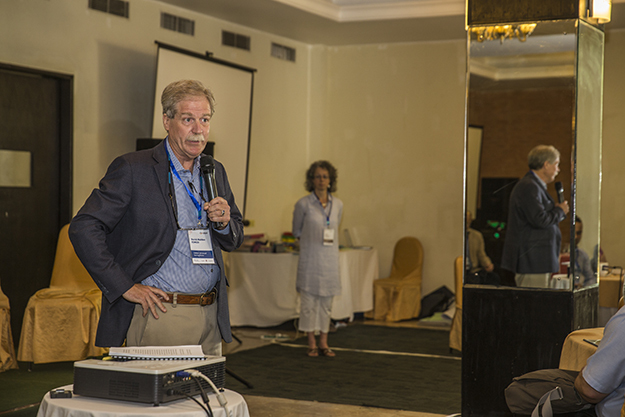 With support from ICIMOD, the event saw 85 participants from 22 countries in Africa, Asia, Europe and USA in various roles as practitioners, researchers and communicators put their minds together. The event entitled, Dialogues for Impact, shared emerging lessons for developing countries as they formulate and pursue nationally-determined contributions (NDCs) and national adaptation plans (NAPs). It identified opportunities to synthesize and communicate insights from ongoing work, including how SDG targets inform adaptation and broader development thinking and practice. Further, the emerging issue was to make our research more relevant to those who can affect, and those who are being affected. Rather than being a scientific conference, the push was on outcomes from our learnings. This was reflected not only in the discussions based around CARIAA findings, but also the manner in which a dialogue was set for eking out a path towards better uptake of our research. And how does this uptake occur? Through the process of research-into-use (RiU) of course. The terminology simply refers to the practice of putting research to use through identifying a communication plan that makes stakeholders a part of this uptake. At the ALR3 event, this exercise was visualized in a poster making competition where HI-AWARE’s visualization was of a landscape that showed the upstream and downstream communities involved, and the present outreach that was taking place. In this interaction, the TouchTable stood out as a promising candidate in driving a participatory manner of gathering information being generated from all research initiatives. The poster made by the HI-AWARE team on its RiU activities. The team visualized its activties as being a river basin with mountains in the background, highlighting all outreach activities that have taken or will take place. Another important pathway is to identify windows of opportunities through which research can reach the right people. As HI-AWARE emphasized through its own experience at this event, not only is it important to identify these activities, but also to generate ‘context specific relevant messages’ that are able to reach stakeholders at an opportune time. Many a times in such larger research initiatives, identifying of an event is the easy part. However, when it comes to contributing to relevant planning processes, project timelines often do not match with policy-makers’ schedules. It is rather a question of how these opportunities can be created so that policymakers are not only aware of the research being done, but also how it can be incorporated into national and local level planning. It was discussed that one such avenue was through the process of writing directly to the IPCC secretariat of CARIAA findings. This would allow not only inclusion into IPCC’s upcoming AR6 report, but also it would out CARIAA research on policymakers’ horizons. Along with policymakers, it is also important to keep our on-ground stakeholders in mind for whom the research is being conducted.HI-AWARE not only paid importance to upward, but downward accountability as well. Along with understanding the various bio-physical aspects of climate change, it was also necessary to understand men’s and women’s adaptation strategies to enable these types of responses. The ALR exercise as a whole was a successful example of cross-communication and learning taking place between the four initiatives (ASSAR, DECCMA, HI-AWARE, PRISE) under CARIAA. It was not only an important point of reflection in the timelines of said initiatives, but allowed all those present to take a step backward and reflect on the path ahead. As CARIAA draws to its conclusion late next year, such reflection will allow us to not only deliver credible research, but build on and invest in new partnerships in the global audience.